For the last couple weeks it had been negative degrees outside with the wind chill. Today it is close to 40 degrees, but have you been outside? It’s the bone-chilling kind of cold that makes it hard to get warm again. I’ve been trying to decide if I’m a ‘really cold and low humidity’ person or a ‘cold but damp’ person. While I may never resolve my internal debate one thing is for certain: I DO NOT WANT TO GO OUT WITH MY KIDS IN TOW IN THE COLD! (Insert childish foot stomp here. J) I can’t just run in and out of anywhere and nothing is quick and easy especially with all the winter gear we need to feel comfortable in this weather. BUT, we have to go places if not only to maintain sanity, we have errands to run and prepaid lessons to attend. So how do we make this process a little less painful? Well, that’s great and all but my kid is cold which leads to whining and a cranky mommy! Not to mention that fact that Mommy is cold while she is getting said child out of their car seat and putting their jacket back on at every stop we make. Like it isn’t hard enough to get your kids to places in a timely manner and in and out of the car on a good weather day! 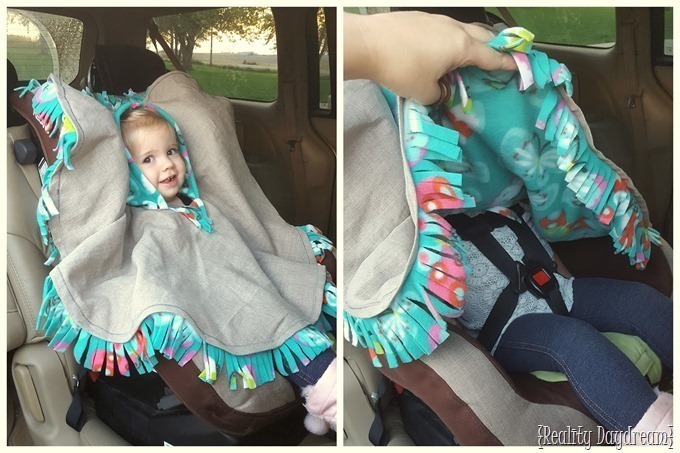 Go on youtube.com or Pinterest and search ‘car seat poncho’. You will find tons of DIY options. There are ones that you sew, there are ‘no sew’ options, there are patterns with and without hoods, double layered, reversible and made with a variety of different materials. And that is great if you have the time, energy and inclination to DIY. I, on the other hand, do not. I am a firm believer in supporting the economy and the creative juices of someone else who likes to do these kinds of things. Me I’d rather chop off a toe. For those of you who feel this way, there are tons of lovely people on websites like ETSY willing to make you a poncho for a price. So how did we end up with a double layered, fleece, hooded, Frozen themed poncho for my daughter? She has a creative Aunt who thinks they are a cool idea and she doesn’t have children of her own to spend this kind of energy on-thank goodness! I wish upon you a relative or two like her. In the meantime stay warm, stay safe and happy ponchoing! Bathtub Practice Dive into our Swim Meets!